*I am NOT a seller so I am making this guide from a buyer’s perspective. 1. Post clear pictures and describe your products honestly. Describe even the condition of boxes. Don’t say an item is brand new when it is not. Show tags as much as possible to provide buyers with date of manufacture. 2. Provide measurements or comparisons as much as possible. An item seen through macro lenses may appear gigantic, when in fact, it is only a few inches tall. 3. Indicate clearly which items are included if the buyer is interested in a set. 4. Please post your prices. It’s difficult to have to keep asking “how much?” (or in my friend Cynthia’s case the very unique “how muchie?- cute!) especially when multiple items are involved. Unless you are open to haggling, indicate if your prices are fixed and non-negotiable. 5. Don’t change your prices midway through a transaction. A short example: I was looking at some cellphone cases a while back. I took a screenshot of the item to show my husband but didn’t bother to peruse the posting closely (my fault, see number two of previous post; I learned from this mistake). I then left a message for the seller, asking her for the price. The seller quoted a number and in turn, I passed on the price quotation to my husband. He quickly pointed out that the picture I sent him had indicated a much lower price. I chose not to pursue the transaction anymore. 6. Once an item is posted for sale, it is fair game for anyone. Unless you mark it as reserved or taken, the first person who reserves an unmarked item should have the right of first sale. Better yet, if you have promised it to someone else, remove it from the album. 7. Don’t say it is on sale when it is not. Some sellers use the word “SALE” loosely to entice buyers. For most of us, the definition of a sale is the opportunity to purchase at reduced prices. 8. Money isn’t everything. We all know that sellers sell to make money, but for patrons of a seller, it does not feel good to be duped or misled. The most common reason for buying online is to cut on costs by shaving off big retailers’ mark-ups. So to find the same items you are selling in the malls at a much lower price than the sellers’ is a big, big letdown. Of course, if you are selling unique or handmade items, a significant premium based on these qualities is understandable, but even then, know how much profit your market can take. 9. Reply to inquiries promptly. Don’t put off your correspondence. Buyers hate waiting and by not acting promptly, you may lose their business. One seller I met promised to text back with details and didn’t; I did not pursue the transaction as I felt ignored and my business unimportant. 10. Provide clear instructions on payment modes. Give your buyers all your options, be it bank payments, money transfers, COD, or electronic money (for example, Gcash). If the last is one of your chosen options, indicate if you are passing on the 1% charge (cash-out fee) to your clients, and only then, charge only the amount which is being transferred via this mode. 11. When products have been paid for, acknowledge payment with your thanks. An acknowledgement of payment assures the buyer that their business is real, solid, and based on mutual trust. 12. 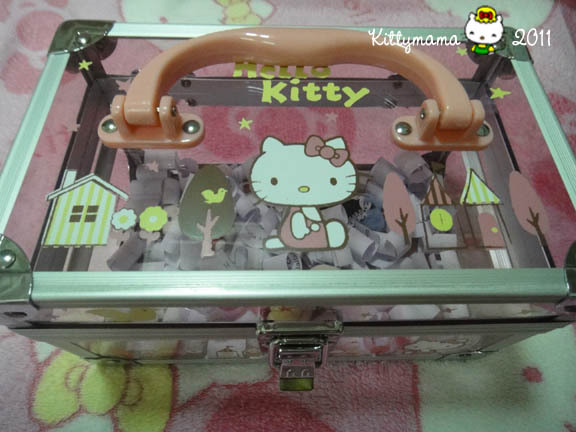 Package your items carefully, especially breakables and fragile items. Also, special touches mean much. Just this morning, I received a package in the mail from someone who I did business with just two days ago. I didn’t spend much, just PhP270, but the seller’s packaging made me feel like a VIP. It really made my day. 13. Send your buyers’ tracking numbers or air bill numbers right away. This should be a seller’s responsibility. Tracking numbers also assure buyers that the contract has been consummated. Trust me, unless you are a good friend, buyers hate running after waybill numbers. 14. If you opt for a meet-up, indicate upfront if the buyer must shell out part of your gas expense. Meet-ups are usually done at the seller’s convenience, not the other way around. The rationale behind this is to save on shipping costs. As such, meet-ups do not usually require charges. Don’t say you can meet her somewhere then later ask for extra money for a service you volunteered because this action shows bad faith. 15. 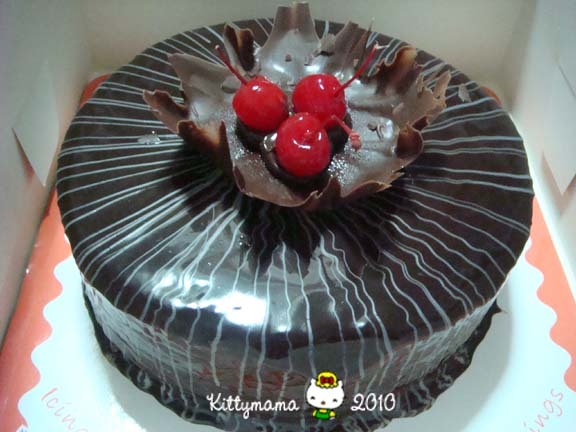 Freebies are very nice and heartwarming, but they not absolutely necessary. Good service, honesty, and a real concern for your buyers count more than whatever it is you can throw in for free. 16. Lastly, keep an accurate database of your buyers’ contact details. Remember their names and match it with their online handles. It’s frustrating to have to keep giving your contact details to someone you’ve done business with repeatedly. Besides, when you start treating your customers as your real friends, they are less likely to defraud you. What can I say about my experience as an online buyer in Multiply/ Facebook? I have been immensely blessed by the people I have met in the forum that the successes still far outweigh the occasional disappointments. I have tried my best to be an honest, reputable buyer and this is a reputation that I would like to maintain and keep. In the end, we–buyers and sellers alike–must remember that an online business, like any other business, relies on good faith and a reciprocity of service, goods and trust. That we are able to develop friendships beyond the confines of the material world is a blessing that makes this world a much smaller, less colder place to live in. With Facebook quickly edging out other social networks as the newest buy-and-sell forum in the country, I decided to repost this old article I wrote to help buyers and sellers alike. We join social networking sites for various reasons. Some want to meet new people, others want to look for old friends. Still, some want to join interest groups; others, discussion fora. Whatever the reasons may be, social networking sites provide a new venue where people may interact regardless of geographical distance and limitations. 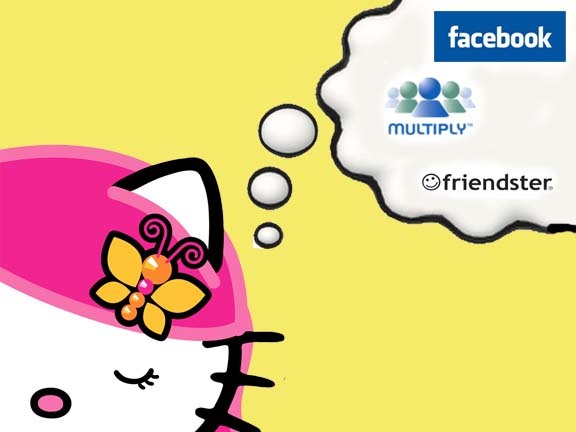 My first foray into social networking sites was in Friendster. Joining was actually a no-choice as I did it simply to monitor my then thirteen-year-old son’s activities on the Internet. Later on, as I got more net savvy, I joined Facebook whose appeal lies on its interactivity and its games. 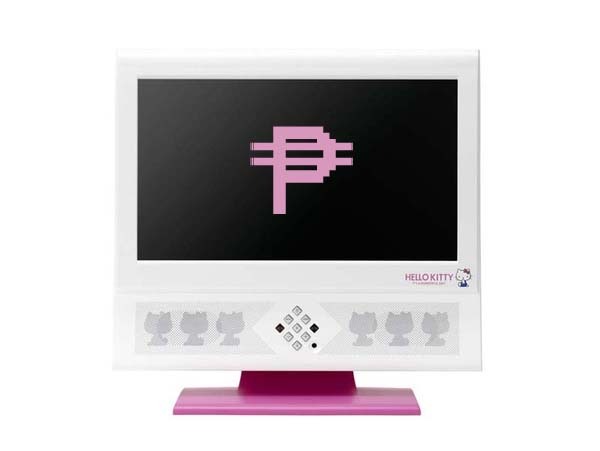 At around the same time, I also opened a Multiply account, and on this, I have to be honest and say I joined to be able to buy Hello Kitty stuff online. I have, in the last two years, been a frequent online buyer. In the course of doing business with others, I have been witness in my circles to breaches in social rules that result in joy reservers, bogus buyers, and bogus sellers. How, then, do we attempt to avoid all these headaches? Here are some suggestions for buyers (part one) and sellers (part two) alike. If I miss anything, please feel free to add them in the comments section and I will update the list and give you credit for the suggestion. 1. Read. Read seller’s descriptions very well and repeatedly to avoid misunderstanding or false expectations. 2. Check first if the item price has been posted before asking “how much?” This saves the seller from unnecessary inquiries and saves her time and effort. 3. If you have questions on the item, do not hesitate to ask via text or email but always introduce yourself and indicate your purpose clearly. 4. Be polite. Send polite and clear inquiries whether it be via email or text. 5. When using private messages, do not use text language. Do not assume that your seller is well-versed in text language. Phrase your questions clearly and in complete words to avoid having to repeat the same inquiries. 6. Once you make a reservation, make sure that you are serious in buying and have the money on hand to pay for it. Don’t reserve today if you are looking to pay for it with next week’s salary. By locking out an item you cannot pay for, you are depriving the seller the chance to make an honest profit from a sure buyer. 7. Provide up-to-date and clear contact details. Indicate your handle and provide your real name, address, cellphone and landline, and even your zip code. If your home address will likely cause confusion for the courier, elaborate by giving landmarks. 8. Know your seller. Don’t be afraid to ask for a name and contact number; after all, you have given them yours. 9. If an invoice is due any day, set time to check your inbox for messages and updates. You cannot excuse late payment by saying that you were offline. If you can go online to reserve an item, you can go online to finalize the transaction. 10. For preorders requiring down payment, pay your deposit promptly. Two years ago, deposits were virtually unheard of and trust was the rule of the day but because of bogus buyers, sellers have been forced to ask for deposits to ensure future payment. We do not want to wait for the day when sellers will require full payment upfront even for preorders. 11. Mark the estimated time of arrival on your calendar for preorders so you will know when to contact your seller for updates. With their growing list of clients, sometimes, they are hard pressed to provide each and every one with update. In an ideal world, such a responsibility would hardly merit a second thought- it would be a given. But since you have paid your deposit, you must share the burden of following-up on your orders. 12. Pay promptly, preferably on same day as the invoice. Sellers generally give their clients a short leeway and time allowance for payment (usually three days). Don’t abuse their kindness and don’t give the seller cause to have to run after you. 13. Don’t use your seller’s pictures to show off your purchases. Unless you are granted permission to repost them with credit, take your own pictures. 14. Be gracious and say thank you for a business transaction done smoothly. If you can, leave recommendations on their feedback page. 15. For complaints, go straight to the seller if you wish for action to be taken. If you are ignored and your complaints are dismissed, then you may wish to take further action by reporting it to the network. You are free to express your disappointment in your blog, but remember to do so with discretion and with respect for a person’s reputation. 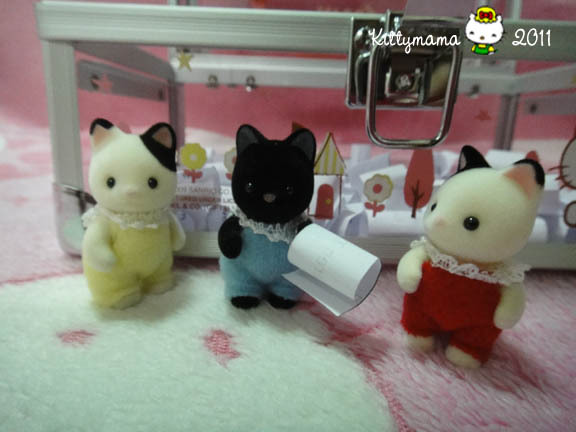 It took a few weeks to make the diorama but now, we are ready to give it away to one lucky person among the first 100 Likes of the PH♥Sylvanian Families page. Many, many thanks to all those who liked the page, who continue to stay and check for updates, who comment on and share our posts, and all those who have opened up their world to us, Sylvanian collectors. This diorama would not have been possible without the kind donation of Madame C of Little Creations. Thank you, Madame C, for the Filipina dress which we are all very pleased to show off to our collector friends abroad. 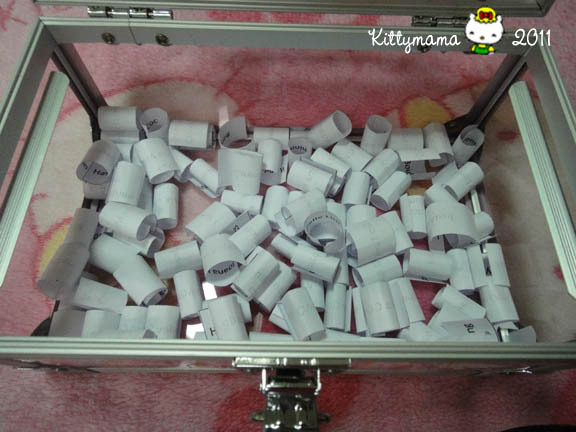 And so, we announce the winner today…. 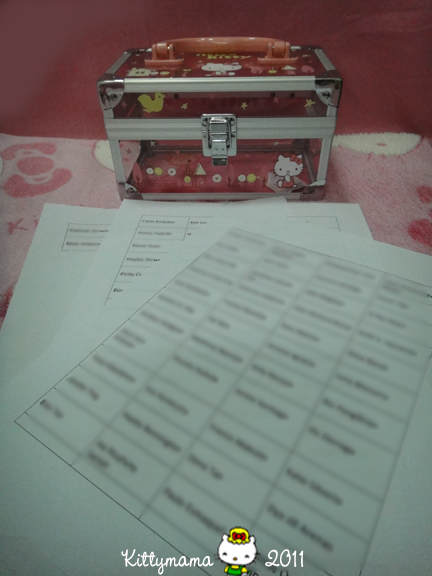 (drumroll please) but before we do so, allow us to share with you the raffle process and how the winner was chosen. 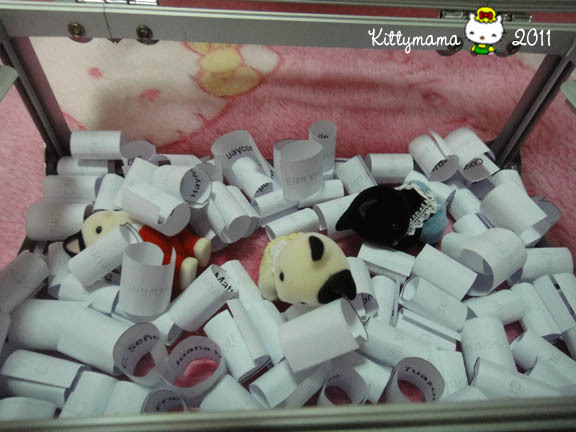 The names were cut into equal sized strips and rolled to hide the members’ identities. 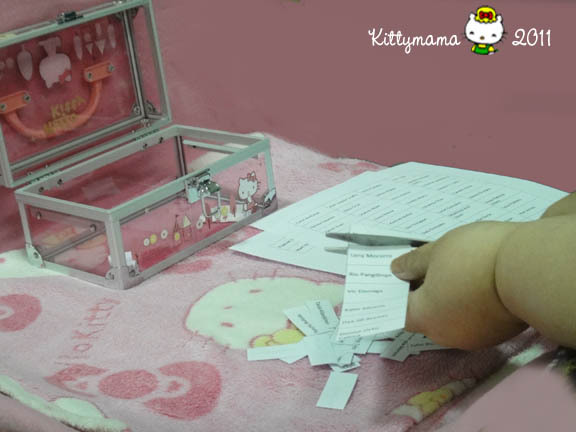 The rolled strips were then placed in a Hello Kitty container which was closed and shaken. but wait…what is that mewling we hear? We quickly opened the box and were surprised to see three little dizzy creatures who just had the ride of their short lives. “Thanks for letting us out, Kittymama!” they said in unison. “The Sylvanian Menace managed to lock us in before the shaking,” they cried as they clumsily tried to climb out of the whirly chamber. Midnight had latched on to a piece of paper that had caught on his arm as he stood up. “We have a winner,” he announced triumphantly, as Peppermint and Angelica looked on, still dizzy. 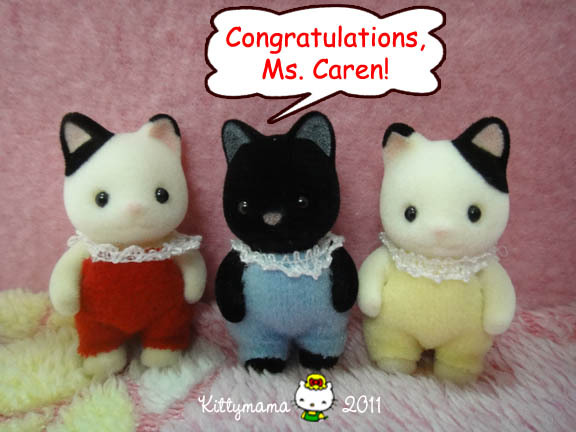 Congratulations to Ms. Caren Tan! Thank you, Tuxedo triplets, for your all your help! 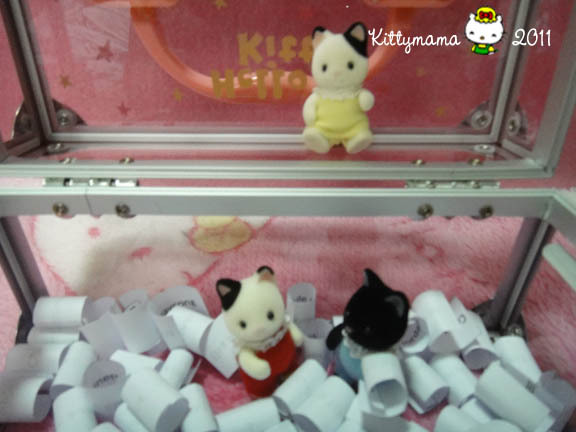 We hope you like it here in Kitty Little Lanes! P.S. The name was actually drawn by Alphonse from among the hundred rolled-up strips. 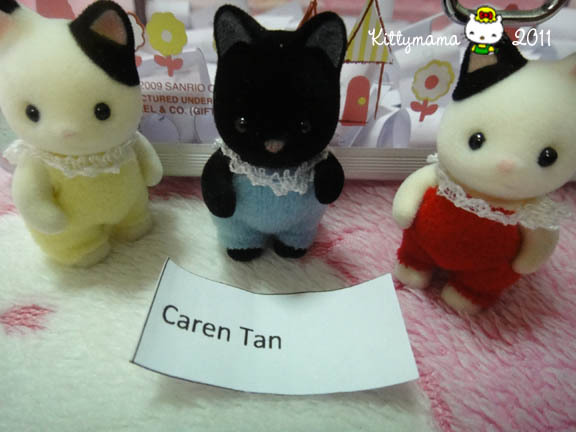 The Tuxedo cats graciously agreed to appear for a dramatization of the raffle because the Sylvanian Menace ran off as fast as he could without time for pictures. My son shared this with me via Facebook today and there’s only one thing I can really say about it. Silly me, I haven’t had my head screwed on right for a time. Sometimes, I forget that blogs are supposed to be updated from time to time. I keep making a mental note to write things down when something- anything- happens. “Remind me to write that down, will you?” I say to husband and he nods absentmindedly while he watches television. I continue with what I do, secure in the thought that I can get back to that thread of thought again. And then we both forget. So, when it comes to finally sitting down and facing the keyboard, I draw a blank. “Honey, what was I supposed to write about again?” I ask husband, who smiles and shrugs at me so genially that I cannot, for the life of me, get mad at him for forgetting to remind me what I’ve forgotten myself. 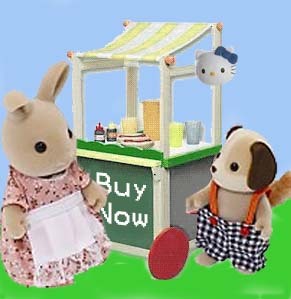 These days, I often find myself drifting back to Facebook, where I have been spotted, online, at least once, by even my friends in the Sylvanian forum. (Hello, Mr. Bear!) Well, I have to be there; my Frontierville farm needs harvesting and my animals need some “tending, loving care” (get it? TLC?). Indeed, it is so much easier to simply click on things, most of the time, and Facebook allows that freedom of unbridled, unrestrained clicking. Then again, once you reach the point where you obsess over small things, like: “How did my FtV avatar get naked and bald?” perhaps, it’s time to move away from the keyboard and mouse and let your brain breathe a little. There. Breathe in. Breathe out. Repeat. Breathe in. Breathe out. And this is where I find myself now, this afternoon, while my eggplants mature in the farm and I wait for my energy levels to rise on its own. Blog life may be vicarious to some, but Facebook is as vicarious as it ever gets. The retreat into a non-thinking, imagined existence can be best explained by the recent events in my home. For some reason, an unsually strong strain of the flu bug has been going around, leaving the household only long enough to allow us time to get well and be reinfected again. It’s afflicted all of us twice and has become nastier each time around. This week, it’s mutated to some weird form of the bug, where aside from the fever and sniffles, the bone pain and the fatigue, it has added even more merciless features of virulence: severe stomach cramps, nausea and vomiting, and the dreaded d word. (Yes, the d word, also known as Hershey squirts. Eewww. And don’t make me spell it out; it sounds gross already.) The last one I hate particularly. Seeing everything inside almost made me faint for joy. I hadn’t expected all these so my gratitude is endless, dear P-Angel. You truly deserve your name for you are truly an angel. Thank you! When I even out the bad (yucky, icky, eewwy, vile &%^$#@ abdominal flu) with the good (A’s loving care (｡♥‿♥｡), Alex’s obedience this week- really! (✿◠‿◠) , Alphonse’s kisses (✿ ♥‿♥), and my friends’ thoughtful gifts (◕‿◕✿) ) then I guess I still come out on the positive side of things. It’s not always easy living in the real world, but when it reminds you that life, however bitter, has moments of glorious happiness, then leaving the safety of predictable Frontierville makes it worth the while. What can I say about my experience as an online buyer in Multiply? I have been immensely blessed by the people I have met in the forum that the successes still far outweigh the occasional disappointments. I have tried my best to be an honest, reputable buyer and this is a reputation that I would like to maintain and keep. I have, in the last two years, been a frequent Multiply buyer. In the course of doing business with others, I have been witness in my circles to breaches in social rules that result in joy reservers, bogus buyers, and bogus sellers. How, then, do we attempt to avoid all these headaches?